I copy your titleblock, paste your diagram and titleblock to an new project launch plug-in D & D terminal block on folio, launch many times plug-in without crashes ... strange! * Relocate the position of different labels because when they were long they left the area. 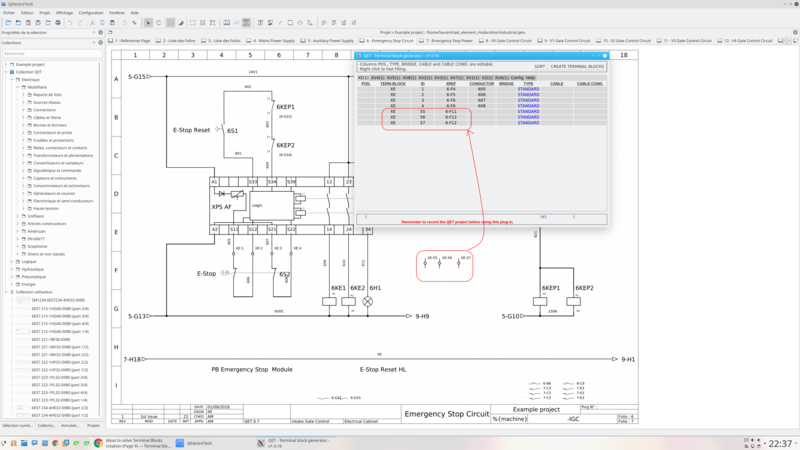 * Show a red message at bottom remembering save the QET diagram before use the plug-in. remmembering the reopen the project to see the terminal blocks generated. Please, check post #157 to install/upgrade instructions. How to draw link between to terminals with same potential ? What is use for "POS" column ? I can't provide new deb package for last 1.0.15 version for the moment. Well fixed .. I package it in manual. New deb packages is available. Ok, I haven't got the last version. With 1.15 : it's ok.
And for the the column "POS" ? What is use for ? The terminals are sorted by default, however the order can be altered writing a value into the 'POS.' column. - In QET, save the project. - Start the plugin. Choose 'Launch the terminal block creation plugin' in the project menu. - Edit the terminal blocks (decribed below). - Press the button 'CREATE TERMINAL BLOCKS' of the Plugin and returns to QET. - Close the project discarding changes and reopen it. - Under the 'COLLECTIONS' tree of the project, appears all terminal blocks. Considerations for creating a Terminal Block from a diagram. - This plug-in searches for all elements of type 'Terminal'. - Normally the terminal elements appears in the QET collection filtering by 'terminal block'. - All the terminals with the same <terminal_block_name> are grouped and are showed into a tab in this plug-in. - If there are a lot of terminals, are splited into diferent terminal block (tabs) to fit in a diagram page. - The terminals are sorted by default, however the order can be altered writing a value into the 'POS.' column. - Also you can specify the cable and conductor that the terminal belongs (columns 'CABLE' and 'CABLE COND.'). - There are 3 types of terminals you can specify in the 'TYPE' column. - The bridge column indicates a bridge from current to the next terminal. - To edit a cell, <Left click> in that cell. - For faster filling, <Right click> in a cell, and auto-fills it with the value showed at the bottom of the colum. - Pressing <Return> after editing a cell, refreshs the auto-fill. I just provided new deb packages for lastest 1.0.16 version. 32 bits version (first link) works well ! Just someting strong : terminals are upper than the "integreted version". During use, there is one black window but it's not a problem. Only double-click on exe to start terminal generator. I didn't test 64 bits versions. But try the second link if you can, maybe it fix drawing size... (other VM and other Windows version but without visual studio code install). It work but with the same problem of size. Do you included it to the readytouse version ? Now, I have the same result of size on LM18 and the readytouse version. Terminals are upper than before: I think, script changed on last version. The terminal generator doesn't draw reserve ? How does it work ? The terminal generator doesn't draw reserve if terminals does not exists in your diagrams. In older version you can rename reserve terminals free. It work only if you create free terminal like "x:9" on your diagram, before running script. could you add possibilites to a add free terminal on table : between two used terminals or at the end ? I use this method, but it's not a beautifull solution... When you add 10 or 20 free terminals for exemples. I think, if we can add line on edition table it should be great. peu t'on nommer les bornes comme ceci avec le generateur? Je le fait manuellement, pour des petits plans.